Winners two years ago when the tournament was staged in Melbourne, Honoka Hashimoto and Hitomi Sato had to settle for runners up spot two years later. On the early evening of Sunday 29th July, the no.2 seeds, they were beaten in the final of the Women’s Doubles event at the Seamaster 2018 ITTF World Tour Platinum Australia Open in Geelong by colleagues, the top seeded partnership of Hina Hayata and Mima Ito (11-8, 11-9, 11-7). Trying to break the rhythm of the attacking partnership of Hina Hayata and Mima Ito was the task for the defensive duo of Honoka Hashimoto and Mima Ito; changing from defence to attack, taking risks when the chance arose they did cause the top seeds problems but once Hina Hayata could execute their strong forehand topspin strokes, the odds were heavily with the top seeds. The fact that Hina Hayata is left handed and Mima Ito right handed gave the pairing the opportunity to seize the initiative with forehand attacking strokes; the heavy top spin imparted on the ball by Hina Hayata combined with the rather faster more drive style strokes of Mima Ito was the formula. Hina Hayata and Mima Ito captured the opening two games, winning the crucial points. In the third game, on many occasions deciding that attack was the best form of defence, Honoka Hashimoto and Hitomi Sato established a 6-4 lead. However, at 7-all it was parity, the stage at which the forehand topspin play executed by Hina Hayata and Mima Ito proved dominant. They did not lose another point; the title was secured. Notably it was for Hina Hayata and Mima Ito their fifth appearance as a partnership in an ITTF World Tour Women’s Doubles final; their fourth success. The partnership formed last year, they finished in runners up spot in Korea, beaten by Germany’s Shan Xiaona and Petrissa Solja before enjoying a run of success that continues to this day. Later in 2017 they won in the Czech Republic and in Stockholm before earlier this year succeeding in Germany. Meanwhile, for Honoka Hashimoto and Hitomi Sato it was also their fifth ITTF World Tour Women’s Doubles final, only their second defeat. 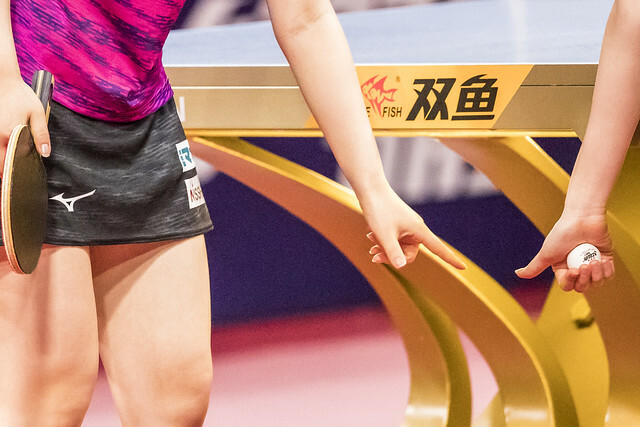 In addition to the Melbourne success, in 2016 they also won in Austria and Belarus, before in 2017, also in Austria, having to settle for runners up spot when losing to China’s Cheng Xingtong and Sun Yingsha. In Geelong, it was as in Austria, second place.